The Day It All Came Crashing Down | Keep It Up, David! Damn, it was scary! I startle easily, and the loud, unexpected nature of the crash scared the crap out of me. My heart skipped a beat, and for a second, I braced myself against the couch, fearing it was an earthquake. But nothing else was moving. 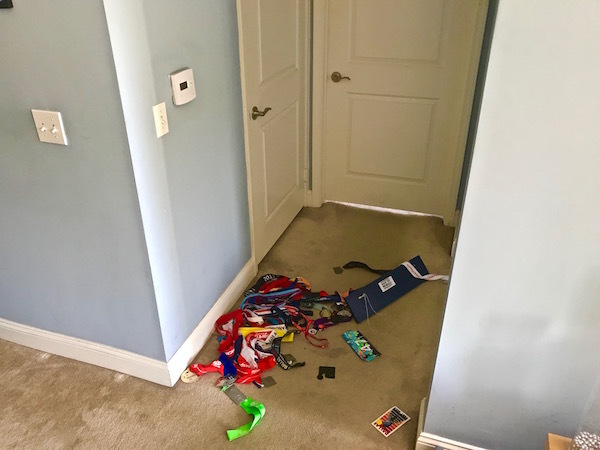 The medals were the only casualty. Well, they took out the thermostat on their way down, but that was an easy fix. I have no one to blame but myself. I hung that rack almost two years ago, and did a crummy job. I knew I had done a crummy job back then, too, but I was in a rush and I figured I could always go back and do a better job, which of course I never did. After picking up all the medals, I hung the rack back on the wall, the right way. It’s not going anywhere. 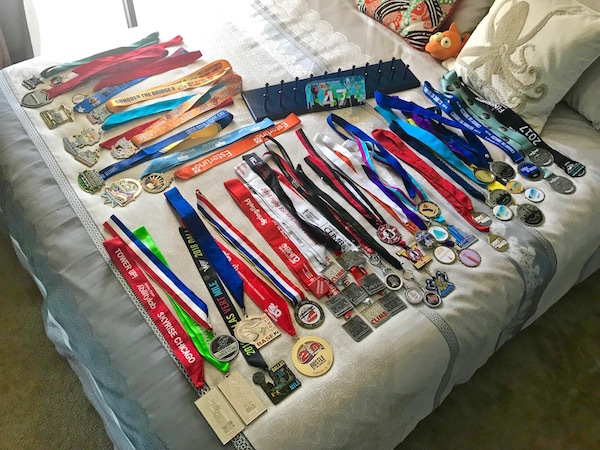 And then I laid out all my medals on the bed, so I could organize them before rehanging them. That’s when I realized… WOW, I have a LOT of medals! I had 28 medals when I first hung the rack in September of 2016. 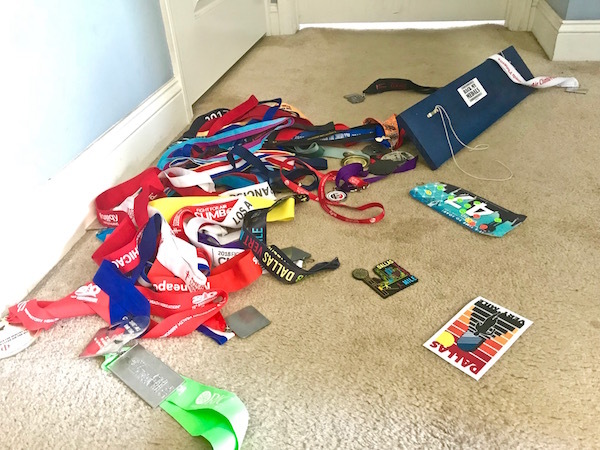 They’re all finisher’s medals, but I earned every single one. Now I have 52 – almost double! Apparently that was too many to support when you do a crummy job hanging the rack. I like to think that the Tower 2 Tower medal I earned a few weeks ago was the last straw. It was fun putting the medals back on the rack, because each medal brought back memories. They’re loosely arranged, with the landmark climbs (like Willis Tower, 1 World Trade Center, and the Dallas Vert Mile) on the far left. And, in case you’re wondering, the trophy I received for completing the Eiffel Tower Vertical is on a shelf in my living room. 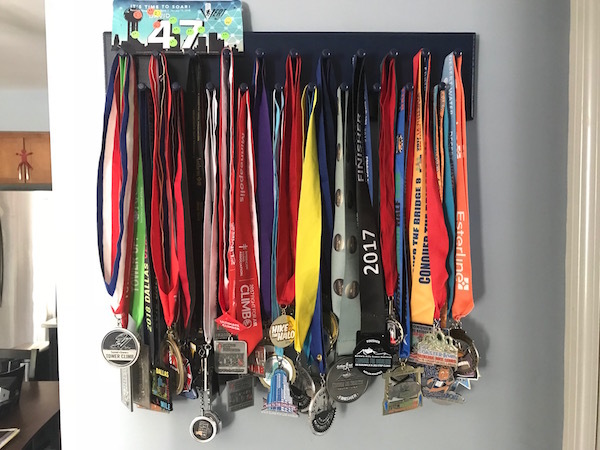 I went back and read my post from when I first hung the medals rack, and I was taken aback because 1) it’s a very motivational post, to toot my own horn, and 2) I wrote it at a time when I was struggling to stay motivated – which is what I’m feeling right now. But what I’m focusing on right now is that each medal represents a day in my life where I showed up and gave something my all. And, as a result, I’ve accomplished incredible things, like racing up the tallest buildings in town, that never would’ve been possible at 402 pounds. I’ve changed my life for the better when I lost 160 pounds, and it continues to improve every day I keep that weight off. These medals push me to keep going, partly because I love seeing what I’m capable of, and partly because I WANT MORE MEDALS! Maybe the crash was what was needed to help shift my perspective. It’s easy to fixate, when you’re struggling, on everything that you perceive is going wrong, or that you’re failing at. I do it a lot. And while I was doing that, I was walking back and forth past a wall full of medals that say exactly the opposite: that I’ve challenged myself and conquered those challenges, and have victories and successes that no one can ever take away from me. 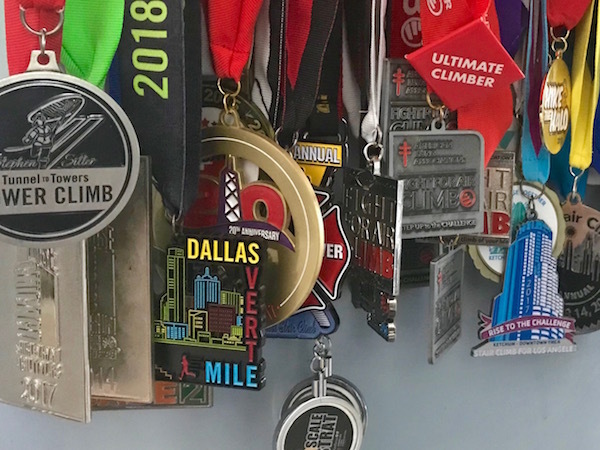 Each one of my medals is a huge source of pride, and embracing that pride feels so much better, and is so much more rewarding, than feeling weak, or less-than, or stuck. Remind yourself of what makes you proud, folks, and don’t forget. I’m going to do the same. This entry was posted on Thursday, June 28th, 2018 at 1:13 am and is filed under Uncategorized. You can follow any responses to this entry through the RSS 2.0 feed. You can leave a response, or trackback from your own site. Congrats on doubling your medals!!! Very inspirational! Sometimes it takes a disaster crashing down around us to make us see the absolute beauty of life!